Note: Click on text highlighted in light blue to launch the document or photograph in a separate window. 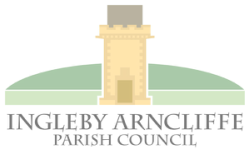 Thomas Vasey Adamson was born on 11th July 1884 at Hutton Fields in the Sub District of Hutton, in the Registration District of Stokesley. His father was Thomas Vasey Adamson and his mother was Thomasin Sarah Adamson, formerly Husband. His father was a farmer and lived at Field House, Hutton. He was baptised Thomas Vasey, son of Thomas Vasey Adamson and Thomasin Sarah Adamson, on 23rd September 1894 in the Parish of East Rounton. His father was a farmer from Hutton Fields Farm. 3. 1911 Census (2nd April). Grinkle Carr Farm, Ingleby Arncliffe. Thomas Vasey Adamson, head of family, married for 24 years, farmer, age 46, born in Crathorne Parish. Thomasin Sarah Adamson, wife, age 43, born in Middleton on Leven Parish. Jane Elizabeth Adamson, daughter, working on the farm, age 23, born in East Rounton Parish. Two children between the ages of 16 and 23 not living with the family and therefore not listed. Thomas Vasey Adamson, son, working on the farm, age 16, born in Hutton Rudby Parish. Annie Maria Adamson, daughter, working on the farm, age 14, born in Hutton Rudby Parish. Violet Emily Adamson, daughter, school, age 11, born in Hutton Rudby Parish. George Edward Adamson, son, school, age 9, born in Hutton Rudby Parish. John Stanley Adamson, son, school, age 7, born in Hutton Rudby Parish. Olive Christina Adamson, daughter, age 3, born in Ingleby Arncliffe Parish. 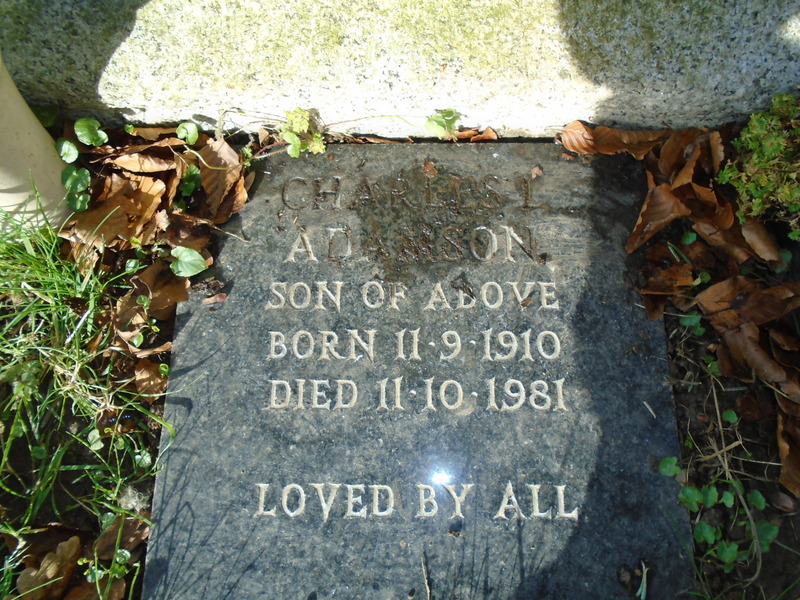 Charles Laurence Adamson, son, age 6 months, born in Ingleby Arncliffe Parish. 4. Memorial stone in the church yard of All Saints, Ingleby Cross. Photographs: General view, close up of parents' inscriptions, close up of Charles L Adamson's inscription. 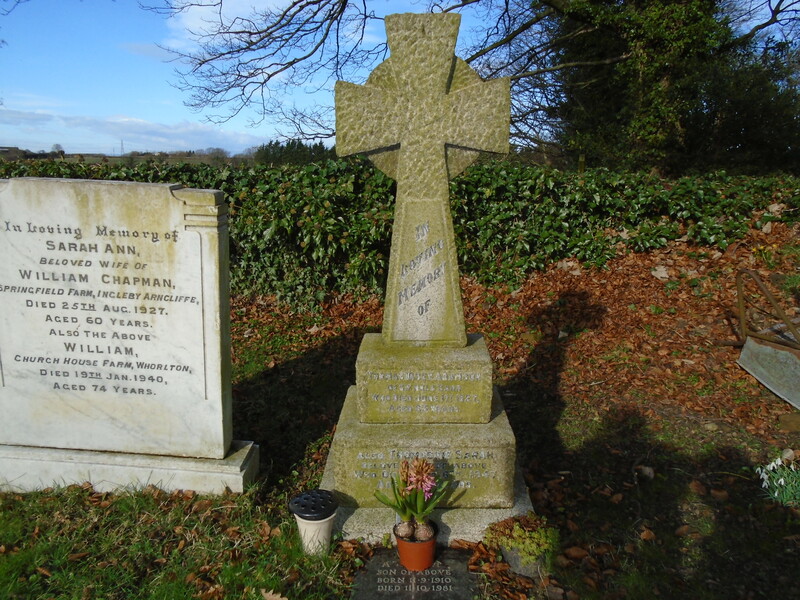 Thomas Adamson’s father, mother and youngest brother are buried in the church yard of All Saints, Ingleby Cross. 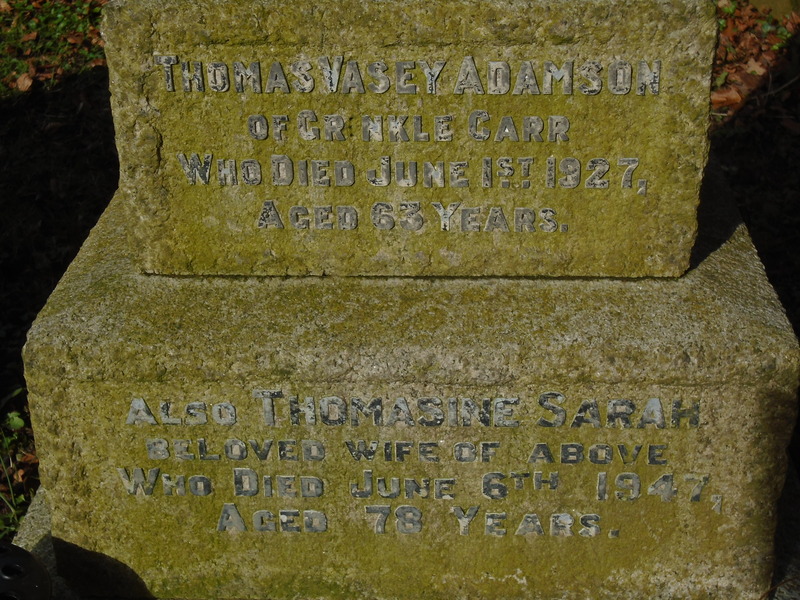 His mother’s inscription is “Thomasine Sarah Adamson”: her Christian name is spelt with an “e” on the end. In References 1 to 3 above, her Christian name was spelt without an “e”. On the Commonwealth War Graves Commission website, his mother’s Christian name is spelt with an “e” on the end. This information will have been provided by the Next of Kin. Diary " Early in the afternoon the Brigade withdrew through Lihoms to Rosieres En Santerre, which place was reached about 5 p.m. The Brigade dug in here, facing South East, and held the position throughout the night and all the following day. We were in Support, with the 4th East Yorks on our Left. The 5th Yorks Btn and 8th D.L.I. were in the Front line. Casualties 2nd Lt R Campbell wounded and missing. Lt M.W. Macnay and 2nd Lt D.J.E. Lamb wounded." 200838 Sgt Adamson Thomas. Enlisted at Northallerton. Killed in action. Age 24. Buried at Moreuil Communal Cemetery Allied Extension. 6a. May 1918 edition, page 20. 6b. August 1918 edition, page 57. 7. Army Register of Soldiers’ Effects, 1901-1929. Sergeant Adamson is the 3rd entry, which was made in January 1919. He was listed as either Killed in Action or Died of Wounds. Note that his effects went to his Father, suggesting that he was single when he died. 8. Concentration of Graves (Exhumation and Re-burial) – Burial Return form. The lists provide basic details of the individual, but in addition may also include information as to their original burial location and occasionally some details of how they were identified. These additional details would have been omitted if the individual was reburied in the same cemetery or identified using normal methods, for example, via a service tag. Sergeant Adamson is the 5th entry. The figures in the stamp at top right are 2/7/19: 2nd July 1919? Sergeant Adamson was re-buried 3 miles to the south-west in Moreuil Communal Cemetery Allied Extension. Moreuil village and Moreuil Wood were the scenes of desperate fighting in March and April 1918 in which Commonwealth and French infantry, and the Canadian Cavalry Brigade, took part. The village was lost to the Germans, but was retaken on 8 August by the French XXXI Corps. The Cemetery extension was made after the Armistice when graves were brought in from the neighbouring battlefields. 9. 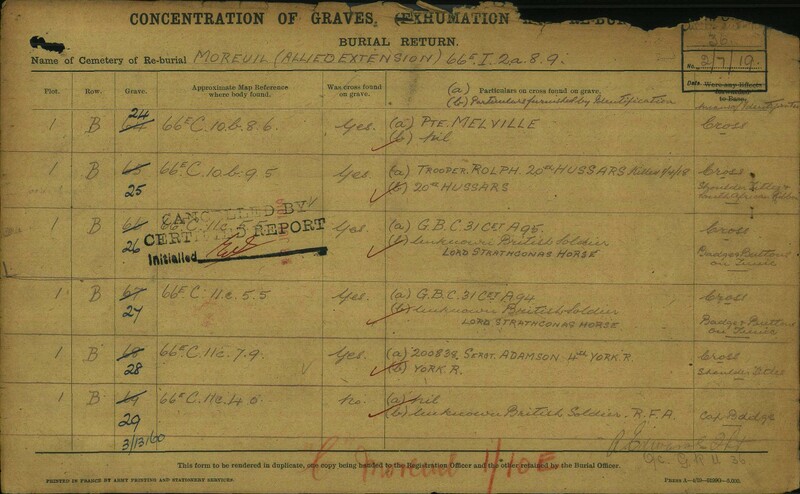 Graves Registration Report Form. Graves Registration Reports (GRRs) are standard forms which detail graves for which the Commission is responsible within a particular burial ground. They provide basic details of the individuals, such as name, service number, rank, regiment, unit and date of death, and are listed in Plot, Row and Grave order. Sergeant Adamson is the 4th entry. The document bears an enquiries stamp dated “23 Feb 1921”. 10. 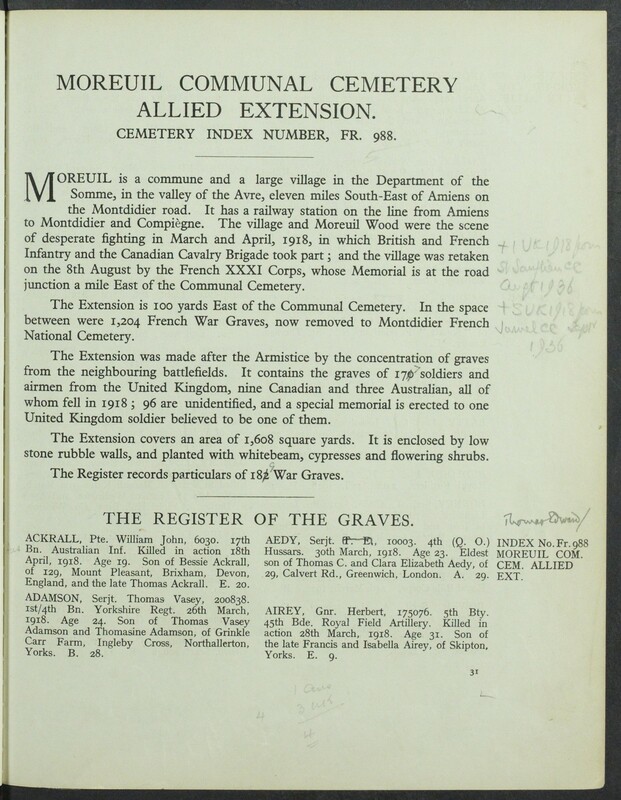 Grave Registration Document – Register, Moreuil Communal Cemetery Allied Extension. Registers were produced by the Commonwealth War Graves Commission on a cemetery-by-cemetery or memorial-by-memorial basis, and eventually ran to 1,500 volumes. They contain an entry for each individual, with details of their rank, regiment, unit and date of death. Many of the entries also include additional information such as next of kin details. Sergeant Adamson’s entry is at bottom left. Note the spelling of his mother’s Christian name (with an “e” on the end), and the incorrect age at death of 24 (he was still 23). The CWGC were notified in February 2017 of his birth date and correct age at death. Their records have been updated, and arrangements have been made to amend his headstone. 11. Location of the grave of Sergeant Thomas Vasey Adamson. Moreuil Communal Cemetery Allied Extension plan. 12. 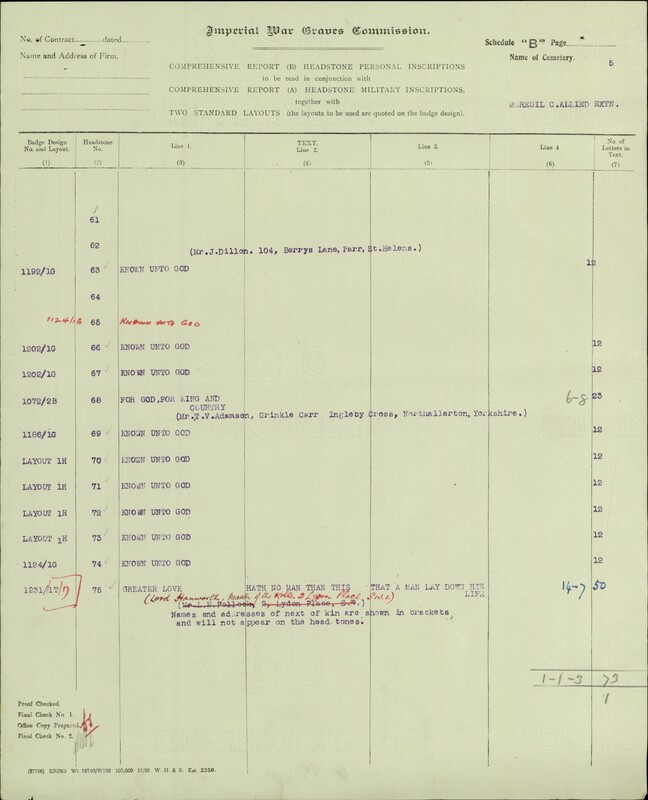 Imperial War Graves Commission Reports of Headstone Inscriptions, Moreuil Communal Cemetery Allied Extension. 12a. Comprehensive Report (A) of Headstone Inscriptions. Sergeant Adamson is the 8th entry. 12b. Comprehensive Report (B) of Headstone Personal Inscriptions. Sergeant Adamson is the 8th entry. Note that the words “For God, For King and Country” were chosen by his Father, indicating that he was single when he died. ​13. Commemorative Certificate for Sergeant Thomas Vasey Adamson. 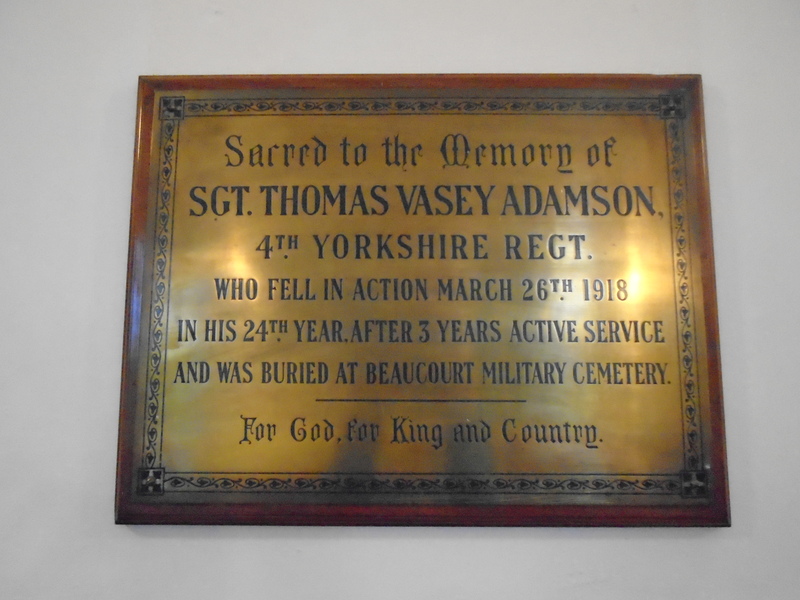 Note that Thomas Vasey Adamson’s rank is Serjeant. 14. Enlarged map of exhumations locations, with an explanation of British WW1 military map references. and was buried at Beaucourt Military Cemetery. For God, for King and Country. Location: about 6 miles west of Rosières-en-Santerre . Beaucourt was the scene of fighting in March 1918 when the village was captured by the Germans. It was retaken by the 3rd Cavalry Division on the following 8 August. The cemetery (called at one time Beaucourt Church Cemetery) was made by fighting units immediately after the capture of the village in August 1918. Beaucourt British Cemetery contains 87 First World War burials, one of which is unidentified. Three of the men, all from the Royal Field Artillery, died on 27th March 1918. The rest, mostly Canadian, died between 8th and 13th August 1918. Whilst researching this biography in early 2017 no record was found of Sergeant Thomas Vasey Adamson’s body having been in Beaucourt British Cemetery. Note: Sergeant Adamson’s Battalion remained at Rosières-en-Santerre during 27th March. On 28th March, the Battalion withdrew south to Vrely, then north west to Caix, then east to Villers Aux Erables (which is west of Beaucourt-en-Santerre). 17. Enlarged maps of the location of Beaucourt British Cemetery, showing its British WW1 military map reference. 18. Enlarged maps of the location of the exhumation of Sergeant Thomas Adamson’s body and the location of Beaucourt British Cemetery. 19. Wide view map showing the location of the exhumation of Sergeant Thomas Adamson’s body, Moreuil Communal Cemetery Allied Extension, Beaucourt British Cemetery, and Rosières-en-Santerre. ​20. 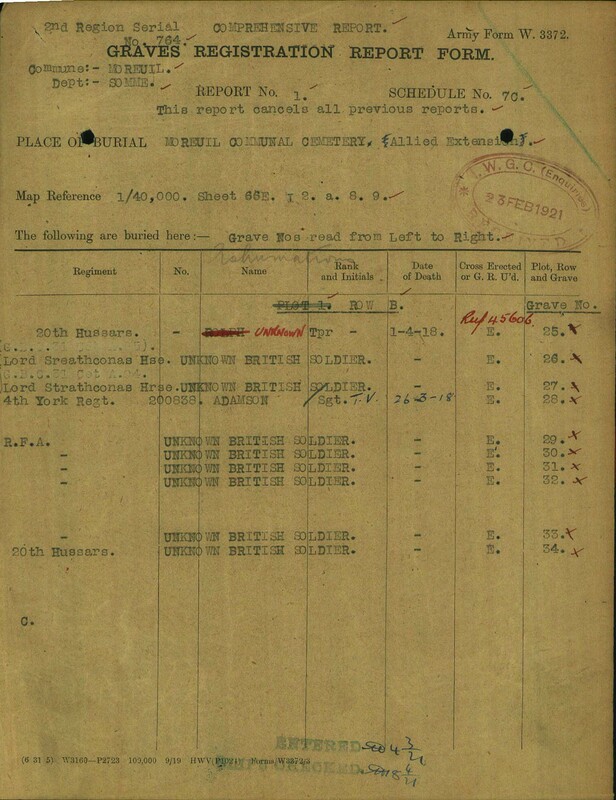 Sergeant Thomas Adamson – Campaign Medal award document. Thomas Adamson earned The 1914-15 Star as a Private in 4th Battalion, Yorkshire Regiment, serving in France on 15th April 1915. His regimental number was 6183. At the time of the award he was deceased. At the time of his death he was a Sergeant in 1/4th Battalion, Yorkshire Regiment. His regimental number was 200838. 21. 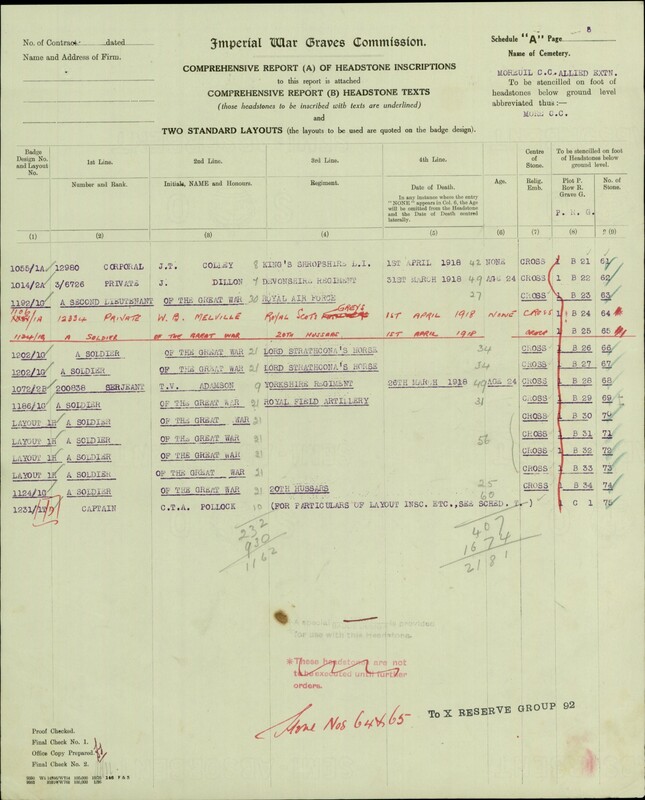 Sergeant Thomas Adamson – Medals granted under Army Orders. The Victory Medal and the British War Medal. 22. Thomas Vasey Adamson – Entitled Medals. The 1914-15 Star (which was authorized in 1918). The British War Medal, 1914-18.